Bringing up a bilingual baby is easy with these wooden alphabet blocks in Spanish and Mandarin Chinese. Su Bebe Es Muy Inteligente! Bringing up a bilingual baby will be as easy as uno, dos, tres with these beautifully made alphabet blocks in Spanish, Mandarin, and Italian. 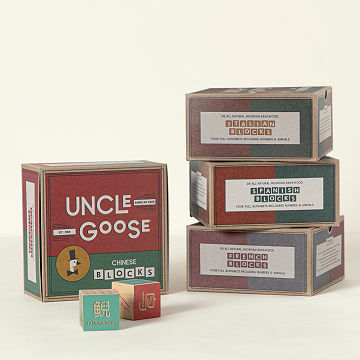 Each block is embossed to give it a classic look inspired by traditional blocks. They are handcrafted in Michigan of Basswood grown in the Great Lakes area and printed with non-toxic inks. The blocks feature beveled edges for a more comfortable hold. Spanish: The Spanish language set includes 28 blocks. Features 4 complete alphabets, 3 sets of numerals, and 28 different animal pictures. Mandarin: This beginner Mandarin set has 32 character blocks. Each block has the character alone and with its English equivalent, a stroke grid to learn how to create the character, and a number and a picture with its pin yin equivalent. There is also a puzzle side for this set... a map of China, the Chinese flag and a yellow dragon (responsible for bringing the seeds of writing to the Chinese people). I have ordered several items from uncommon goods , their products are quality and look like the picture posted. I received the order quickly and was extremely pleased! I have and will continue to order from uncommon goods. Wonderful company!!! The Spanish wooden blocks are a gorgeous and precious bilingual toy, locally hand-crafted, with no batteries or plastic. They will be part of our grandson's life and hopefully his children's lives! This was for a baby's first birthday. The parents are first time parents who do not want anything plastic, gender specific, electronic, or non-educational. This gift fit the description. Our Grandson is already bilingual ! Having looked for blocks that not only provided the educational piece but were pretty and well made wasn't easy. Once I found these I knew they would be the best gift. The family absolutely loved them and will use them for years to come. These blocks are beautifully made. Our almost one year old great grandson is mostly slobbering all over them but the safe ink makes that acceptable. We are confident that soon he will be building and counting in Spanish and learning two languages quickly as his parents raise him to be bilingual. A beautiful thing. We chose this gift for a new baby in a bi-lingual family. I was looking for something unique and focused on education. They were surprised and pleased at receiving a gift that personally recognized the reality of their home and child.